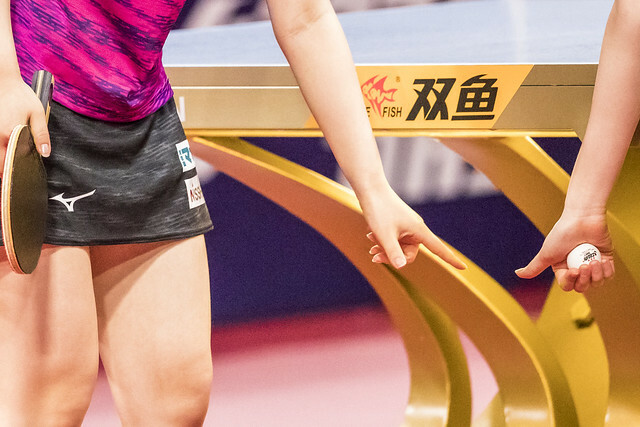 An early exit in Germany in late March, no progress beyond the preliminary round; there was a different outcome for China’s Li Jiayi on Wednesday 25th July in the Women’s Singles qualification tournament, to gain places in the Seamaster 2018 ITTF World Tour Platinum Australian Open. First place in Geelong in the group was the end result. No current World Ranking, the winner the previous day in opposition to colleague Fan Siqi (11-13, 12-10, 11-6, 11-7, 11-8), she concluded her initial stage exploits by overcoming the defensive skills of Japan’s Honoka Hashimoto, at no.24 in the global order, the highest rated player on qualification phase duty. First place and progress to the main draw was secured; Li Jiayi emerged successful in a closely contested seven games encounter (11-3, 11-5, 5-11, 9-11, 11-7, 8-11, 11-9). Disappointment for Honoka Hashimoto, who the previous day had lost to Fan Siqi (11-9, 11-4, 12-10, 11-9) and thus concluded matters in third place in the group, for the other leading names it was a different scenario. The unbeaten record was maintained, top spot was secured. There were comfortable wins for Li Jie of the Netherlands who beat Japan’s Rika Suzuki (11-8, 11-6, 11-4, 11-9) and for the latter’s colleague, Yui Hamamoto who accounted for China’s Che Xiaoxi (11-5, 11-9, 11-7, 11-8). Conversely, there were troubled times for Korea Republic’s Yang Haeun. In her concluding group stage contest she was beaten by Chinese Taipei’s Liu Hsing-Yin in seven games (7-11, 8-11, 11-8, 11-9, 11-9, 11-13, 14-12). However, the previous day in the opening match in the group, Liu Hsing-Yin had lost to India’s Pooja Sahasrabudhe in seven games (11-9, 9-11, 7-11, 11-9, 11-7, 8-11, 11-8). In turn she was beaten by Yang Haeun in four straight games (11-6, 11-4, 11-4, 11-4). Thus games ratio decided; it was first place for Yang Haeun (7:4) followed by Liu Hsing-Yin (7:7) and Pooja Sahasrabudhe (4:7). Eventual success for the Yang Haeun, the highest rated player in the group but that was not to be the outcome for Japan’s Maki Shiomi and Egypt’s Dina Meshref. Maki Shiomi was beaten by China’s He Zhuojia (11-5, 11-1, 11-8, 11-7), Dina Meshref lost to Slovakia’s Barbora Balazova (11-6, 11-8, 11-9, 12-10). Both He Zhuojia and Barbora Balazova duly secured first places. The end of the road for Maki Shiomi and Dina Meshref, it was the same for the host nation’s Parleen Kaur and Michelle Wu. Both suffered at Japanese hands; Parleen Kaur lost to Marina Matzusawa (11-5, 11-4, 11-4, 11-3), Michelle Wu experienced defeat when facing Satsuki Odo. Both Marina Matsuzawa and Satsuki Odo ended the group phase unbeaten and hence in first place. Play in the main event commences on Thursday 26th July.